World in Flames PC Game released! The game that was in the making for about 10 years is now available. 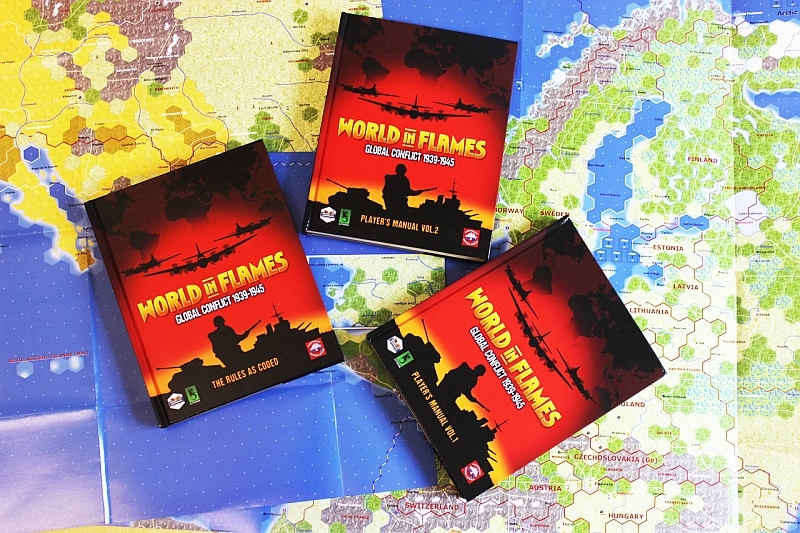 World in Flames, famous monster conflict simulation on World War 2 now playable on your PC, rules enforced by the game and coming with three thick books. The price might be considered acceptable for what you get in the box depending on where you live (since you may strongly disagree on this if you are living in Europe, because the game can only be ordered as a physical copy, not as a download version. That means a lot of money for shipping and Custom then charges on top!) BUT…at launch there’s no AI included and there’s no PbEM function! A game like WiF will be difficult to handle anyway by an AI, but no PbEM is quite a showstopper – who’s gonna play this monster in realtime TCP/IP? Both the AI and PbEM will be made available later we are told (AI will cost though, how much we don’t know yet) but we really think it’s the wrong decision to get the game out without such essential features. For more information check out the official site! World in Flames is Matrix Games’ computer version of Australian Design Group’s classic board game. Covering both the European and Pacific Theaters of Operations during World War II, World in Flames is global in scope while simulating each branch of service in detail. Land units are corps and army level, supplemented with specialized divisions. Naval units include individual counters for every carrier, battleship, cruiser, and light cruiser in the war. Using 1000+ unique bitmapped images, air units represent groups of 250 to 500 airplanes. With 6000+ unique units, 250+ countries, and a global map of 70,200 hexes, World in Flames is the premier World War II grand strategy game. Harry Rowland, Game Designer of the original World in Flames boardgame, said: “ADG have produced some high quality games over the years but nothing compares to the top-notch components included in World in Flames: the computer game. 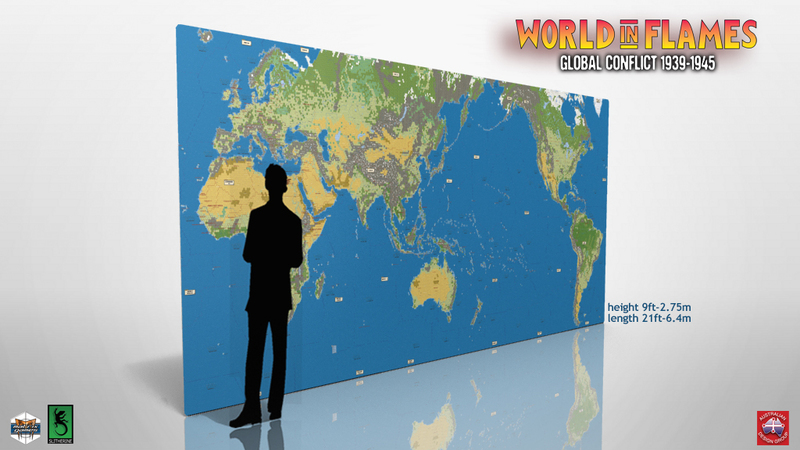 It includes 24 full-colour maps, and 3 hard-covered books of over 600 pages, a real collector’s gem”. Nine of the eleven scenarios from Australian Design Group’s World in Flames Final Edition are included, and they range from the small 5 turn Barbarossa offensive in Russia and the 5 turn Guadalcanal battle in the Pacific, through to the 36 turn Global War campaign which spans all of Europe, Africa, the Middle East, Asia, the Atlantic, and the Pacific. You can play either the Axis or the Allied side or take the role of one of the 8 major powers. Besides solitaire and head-to-head, you can play over the Internet. The last mode of play is for two players, Axis versus Allies. In addition to the full set of rules from World in Flames, Final Edition, there are 58 optional rules. Australian Design Group’s expansion modules Ships in Flames and Planes in Flames are incorporated into the basic game, but the inclusion of other expansion modules, such as Mech in Flames, Carrier Planes in Flames, and Cruisers in Flames, depends on which optional rules are selected. This simulation models national production from conveying raw resources to factories using rail lines and overseas pipelines for producing infantry, armor, naval, and air combat units. Because oil was so important during World War II, there are separate optional rules for synthetic oil plants and deployment of oil reserves to the front lines. Game units represent armies and corps, aircraft carriers, naval task forces, and air groups that took part in World War II. Everything you need to re-fight the greatest conflict in history is provided in World in Flames. The players make the strategic decisions that decide the fate of nations. What forces to produce, where to commit them, when and how? No two games of World in Flames play the same, no strategy is foolproof, any decision may have unforeseen, long-term consequences. If you want to change the world then World in Flames is for you. How can you “play war”? Especially in Germany, the need of explanation and lack of understanding for the hobby “wargaming” and “historical conflict situation” is significantly higher than in the US or UK, at least for games dealing with WWII or WWI, while other historical eras, for example Napoleonic or Ancients, are at least tolerated, but nevertheless frowned upon. That it’s about understanding tactics and strategy, understanding historical decisions, that we use it as a sort of ‘educational tool‘ to get some insights you don’t get by simply reading a book or watching a movie. That we love the chess-like competition and the challenge of tense decison making in an interesting and historical setting. That you can use historical consims to answer “what if” questions (“why didn’t they do this and that historically”, keyword: Operation Sealion) and to understand historical situations better, for example battles for seemingly useless hills or other positions. Last but not least, “those who fail to study history are doomed to repeat ist”. But we also think it’s not necessary to excuse ourselves for loving this hobby – and it is well known that one can get interesting insights into some battles, which is leading to a better understanding of the whole picture. This way wargames can help to provide a better understanding for the real men fighting in those battles – and dying. If you read in a book that men died while taking a seemingly useless dirty hill somewhere in nowheres land may sound absolutely crazy and like a damned waste of life, but to set up the battle yourself may change your view about it entirely. Sure, it’s still a hill and war as such is a crazy thing and everybody dying in a war is indeed a tragedy – but the consim you are playing about this specific battle might give you a better idea of how difficult it really was what these soldiers accomplished by taking the hill. And it might also become clear what the reason behind the assault on this hill was and how it affected the ‘bigger picture’. You might understand that it was a keypoint in a supply line and that by taking it other soldiers could be supplied with necessary stuff to stay alive. Or you might see that the whole situation was doomed to failure right from the beginning when generals thought it to be a good idea – giving you the necessary background to judge certain responsibilities of those who were in charge of a certain operation. If you play a military strategy game about certain battles or operations, you come much nearer to it than by any other means. Wargamers – at least those who play historical conflict simulations – usually don’t just “play games”, but they use a whole bunch of ‘tools’ to understand and evaluate historical situations and learn about certain aspects of military doctrine executed in a historical battle. Reading books, watching documentaries, visiting historical battle sites, discussing with others, playing consims… all this is done in order to understand military thinking and to learn from history. Because of this, we consider it a good idea to hold a special day in memory and honor of all those soldiers who fought for the freedom we enjoy today. It is because of those lads who died for liberating the world from dictatorship that we are allowed to play these games today – in times of freedom and peace – and that is something we should at least be conscious of once a year. We have chosen the Longest Day, June 6th, D-Day, as our Remembrance Day, because this brutal battle was the beginning of the end of WWII and therefore seems to be a very good choice for representing all other battles in that war. On that day, in that battle, all soldiers fought for what they thought to be good reasons to fight for – and in our opinion that’s true for the entire war. The real bad guys those days were the politicians that were in charge and not the average, common soldier who was as abused in this war as he is in any war. Thus, the Longest Day is held in remembrance of all participants of WWII in particular, but in honor to all soldiers that fought in other wars as well. We suggest that those involved in THE HOBBY either do not play wargames on this particular day or do so with a heightened awareness of being in a lucky situation today. Maybe you choose to read a book instead, watching a movie about that time or visiting specific warfields, war-museums, taking a look into old family photos portraying those who perhaps lost their life in WWII etc.. If you choose not to play any games on this day (or any other day that you find a better choice for such a personal Remembrance Day) consider it a sacrifice of possible playing time, of having fun, once a year as a symbolic sacrifice to those who didn’t have the opportunity or choice to play it all out on some maps with a few counters, and were forced to take part in the brutal events on June 6th, 1944 that nevertheless finally gave us back – freedom! In view of the current events in Libya, DVG published a new Campaign for Hornet Leader – Carrier Air Operations: Libya 2011. In this scenario, the US sends a carrier task force to aid the anti-Gadhafi revolutionary forces in their conflict with the loyalist forces. You can download the Campaign for free from the DVG website (PDF, 234 KB). Planning, calculating, and conducting CAS missions together is challenging and fun! We love cooperative games! We enjoy the card game Space Hulk – Death Angel, we love cooperative board games like Arkham Horror or video games like Too Human or Borderlands on Xbox 360. Thunderbolt / Apache Leader isn’t a cooperative team-game in the first place, it is primarily a solitaire game, but it offers variants for cooperative team play, so one weekend we decided to give the game a try… together! We own a number of solitaire wargames, for example the Ambush series, London’s Burning, B-17, Carrier, Patton’s Best, even SASL (Solitaire ASL) which are designed to be played by one player “against the game system” or Paper AI. Fortunately, many of these games can be played by two players as well who team up against the enemy. And some of these games even offer specific rules or instructions for playing the game cooperatively. A great example is the modern air combat simulation “Thunderbolt / Apache Leader” by Dan Verssen. This review doesn’t only deal with the coop variant but is a general in-depth review of the game. So if you are a dedicated (or involuntary) solitaire gamer, this review is also for YOU. In addition, we will tell you something about flying cooperatively (which works excellent, btw! ), so if you are a fan of wargames supporting team-play, read on! What is Thunderbolt / Apache Leader? Thunderbolt / Apache Leader (TAL) is a wargame depicting modern tactical air combat, utilizing a combination of card- and counter-based mechanics and a combination of tactical and strategical planning and gameplay. It was published by GMT Games in 1991 and is part of the “Air Leader series”. Since players have to conduct a good deal of math calculation and consulting of several tables, the game is definitely not a “light wargame”, but effectively a consim with medium complexity. In the game, the player commands single A-10 Thunderbolt fighter aircraft and AH-64 Apache attack helicopters. In addition, he can use AH-1 Cobra attack helicopters and AV-8B Harrier vertical takeoff fighter aircraft as support. The game is scenario-based and takes place in various cold-war and contemporary hot spots all over the world: Operation Desert Storm Iraq, Korea, Germany, Russia, Libya. The focus lies on air-to-ground combat, but in the course of a campaign, players can also possibly face opposing air units in air-to-air combat. The objective differs with each campaign. Basically, players have to defend their air base and destroy opposing ground forces before they overrun the base. Enemy ground forces consist of various different unit types, for example SAM sites, Anti-Air-vehicles, heavy armored tanks, infantry, APC, or non-armored trucks. In addition, friendly ground forces (AFV and Mechanized battalions) engage the enemy ground forces, but the player’s main task is to provide air support and to soften the ground targets before the friendly ground forces encounter the enemy. Players can choose between various types of munition for their aircraft. There are three types of attacks, cannon attacks with board cannons, strike attacks with various rocket types (rocket pot, cluster bombs, Mk.82-84), or stand-off attacks with laser-guided missiles (Hellfire, Maverick). A focus lies on resource management; players have only a restricted contingent of “Air base points” with which they have to “pay” aircraft, pilots, and ammunition for each of the daily missions. So you cannot simply put all the cool stuff into your jets and helicopters – you have to plan carefully and in advance if you want to fly and fight another day. Players also have control over different pilots (jets) or crews (helicopters) with various skills and special abilities. Pilots are humans, though, and suffer from stress during flight missions. Choosing the right pilot for the right task is another challenge of the game. Pilots can get lost or end the day in sick bay or shaken, so they cannot fly the next day. Optional fatigue and experience rules add even more realism to pilot management. The map (“Combat Display“) is a sheet printed with several tables, turn record tracks, and terrain space which consists of randomly placed terrain cards. You see the combat area from high above – from an aircraft’s perspective. There are two types of combat resolutions each day – a primary (mandatory) mission which is resolved tactically in aircraft vs. single units of ground vehicles, infantry, or enemy aircraft, and a secondary (optional) mission which is resolved strategically by comparing attack and defense strength, troop quality, and several other scenario-specific modifiers. All in all, Thunderbolt / Apache Leader is a quite simulative game with lots of mathematic calculations and cross-referencing of combat and effect tables. This sounds very technical and dry, but in fact the game accurately portrays air warfare from the perspective of a squadron leader which feels very cool and authentic. TAL depicts modern air warfare, so the overall game design corresponds with the topic. The box art shows photos of the A-10, the AH-64, and infantry soldiers during Operation Desert Storm. The box contains a paper map sheet, several additional displays (a sector sheet and the air base sheet), log sheets for pilot fatigue, counters for several game effects, enemy ground units, friendly ground units, ammunition types, combat results. There are several card decks – double-sided aircraft and pilot cards as well as draw decks for random events. Campaigns and combat conditions are also printed on small cards. The design is somewhat technical and abstract, but all in all, the game looks modern. One of the best Play-by-email tools is the “Cyberboard” program by Dale Larson. Cyberboard is a program which allows you to play even complex Consims such as Totaler Krieg by email (alas, it only works with Microsoft Windows). If offers a comfortable user interface with lots of functions for manipulating and moving the counters, the automatically recording of moves (which can be played back step by step), an integrated dice roller and much more. It allows comfortable gaming with one or more opponents by email. All moves and actions of the players are included into a “Game History”, so that the initial game file grows over the time and eventually consists of an entire game which can be watched like a movie and stored in a gaming archive. Additionally, the program includes another tool (“Cyberboard Game Designer”) which allows to create more game modules for playing your own favorite games via Cyberboard. There are also tons of modules to be found on the internet which are used by a large player community all over the world. he current Cyberboard version is 3.0 – a significant update of the previous versions that has many new features including 16 bit color support and a revamped user interface. Information on the current developments can be found at the Cyberboard-Website (you can also download the program here for free, because Cyberboard is freeware!). The Cyberboard folder. The program even runs under Windows 7 64bit. The first Cyberboard version was programmed for Windows 3.1 by Dale Larson in 1994. He wrote it out of a personal need, simply because he needed a useful tool for email playing – which was quite complicated then. He was annoyed by the errors occurring while playing with a real board and the following transcription of the moves into the computer. So he started searching for an alternative. The initial thought was that playing a board game by email should become more comfortable by simply exchanging automatically recorded moves – instead of complicated descriptions of actions done on a real board, which the opponent must follow on his own real board. Theoretically any board game can be played by Cyberboard, but because of the integrated features it is especially useful for playing counter-based wargames. The program doesn’t include any artificial intelligence, it’s a GAP (Game Assistance Program) – a graphic tool for playing vs. a human opponent. It neither checks if your moves are rules conform nor does it allow solitaire play against the “system”. Larsons idea was to transfer the gaming experience of face-to-face-play to a computer program. And this works great because of the smooth control interface and the game speed by utilizing the recording and playback functions. Cyberboard game files are called "Gameboxes" (*.gbx). They include force pools, maps, descriptions and more. Well, after reading Alan’s article on the issue “what are the positive and negative factors regarding trends and developments in the wargaming/historical conflict simulation business”, I have to admit that – although I agree on the whole with his opinion -, I see some points in a different way. First of all, the reason why we decided to reprint his article on our homepage was the simple fact that everything which is discussing this hobby and the ways how it can be brought back again into the consciousness of a wider audience is something worth supporting. Furthermore the fact that this article was published many years ago without losing its importance today is certainly an indicator that the situation the author addressed at his time hasn’t actually changed much – as we can see nowadays, because wargaming as a hobby is still shrinking and is still what Alan used to call an “esoteric hobby“. So the question actually is: what went wrong over the decades from those glorious days when wargaming was an intellectual challenge with millions of sold games? Or better: are the reasons mentioned by Alan actually those which caused what he calls the “decline of wargaming”? The consumer – digging his own grave? First he states that the customers demanded a different way to purchase their games. In the early days all wargaming companies made their money through direct postal sales until the players wished to buy their games in their local stores instead. This quickly changed the cost factor because the companies were forced to react to the now longer distribution chains which eventually made the games much more expensive for the customer who was buying this stuff and who was the one financing the entire market. The second reason is the change in the very nature of wargames, because according to Alan everything started with games with a relatively low complexity level, until these gamers wanted more realism and more detail. Since companies are usually acting in accordance to the customers’ wishes (to get their money), they started to produce more detailed and more complicated wargames and this was driven over the edge – in Alans opinion – so that a newbie, someone who never played such a game, is completely lost when reading an extensive rulebook for the first time. Based on these two main points he now explains why it is necessary to step back in this process to give wargaming a new chance again. Despite the fact that Alan Emrich wrote his article some years ago, I think it is as relevant today as it was then – perhaps even more, because his predictions have come true by now. Especially video games and PC games, which had an explosive growth since the end of the 90’s, finished the job which was started by colorful and easy-to-play role-playing games in the 80’s: lack of new recruits is more than evident these days. If you take a close look at today’s consim scene you can easily recognize that the average age is even higher today than it was when Alan wrote his article (and even then the 28-45 year olds were the largest part of the community), while it doesn’t attract players younger than 22 years. The same people who were active in the consim scene in the early days are growing old together with their hobby, while the attraction for younger gamers is constantly diminishing. In my opinion the strongest rival in this race are attractive, spectacular videogames (for example the Call of Duty and Battlefield series), which offer more action and more of the feeling of being “within the game” than perhaps an ASL scenario – or at least this is what the unexperienced newbie may think when comparing these two. Besides this, videogames are always “introductory” and can be learned within a few minutes to a maximum of one hour by every player, no matter how unexperienced he is. All we can do is promise that learning a complex consim and working yourself through a monster rulebook is worth all the time and effort – because once you get a grasp on the game system, you’ll get a very deep feeling for tactical and strategical situations – deeper than any videogame can offer. Learning the circumstances of a historical battle, about the importance of a seemingly unimportant island or hill, the importance of securing supply lines, of morale, of leadership, answering “why didn’t they do this and that” and other “what if”-questions gives very fascinating historical insights into war. This doesn’t mean that games like Call of Duty don’t deliver an “authentic” front feeling, but it’s more of a spectacular, roller-coaster, fast-food type which is intense for a few hours, but forgotten when the next game launches. It doesn’t answer any questions or give deep insights into strategical and tactical decisions and problems. But what is this promise worth? We will get nothing but a pityful look and a patronizing comment that we could enjoy our dusted counters and pages of tables and ballistic calculations if we want to. But why should today’s youth bother with calculating the combat odds for themselves – software and videogames do this superfluous background work and all these little calculations and all what’s left for the player is the mere gaming experience and fun! Even if you have the rare lucky moment in finding a young person interested in history who is also after simulation and authenticity and a very accurate presentation of a specific event or combat, you will have problems in fighting your “evil rival”: there is no fight, no era, no battle you won’t find in a PC based simulation. By the way, PC games offer a huge advantage over boardgame based simulations – they almost always include a multiplayer modus over the internet which replaces the face-to-face gaming which was typical for gaming groups in the 90’s. Even fans of roleplaying games tend to switch over to the Massive Multiplayer Online Roleplaying Games which allow them to dive deep into a virtual world without wearing out their fantasy too much and without the need to read heavy rulebooks or to calculate combat effects on tables (the only exception are Live Roleplayers, but this type of RPG cannot be compared to a “boardgame” but more to Gotcha or Reenactment as contrasted to a Wargame). What was only starting to become evident in the future – as described in Alan’s article -, has grown into a serious threat for the hobby today. Don’t get me wrong – I don’t want to condemn videogames, especially not realistic tactical shooters: I love to play them myself and we enjoy the cooperative Spec-Ops mode in “Call of Duty Modern Warfare 2” or the Conquest mode of “Battlefield Bad Company 2” together with our friends… the point is: today’s youth – tomorrow’s wargamers – simply don’t know of the existence of different kinds of strategical and tactical gameplay, because the wargaming scene, the games, the magazines, the forums, the mailing lists etc. are not present in the eyes of the potential wargamer. We’ve really managed to do it to ourselves since 1972. We walked down the primrose path of wargaming consumerism willingly enough, nominally “looking forward” while losing our peripheral vision. By doing what was best for us as individual wargamers, buying games with more complexity and sophisticated graphics to meet our maturing tastes in historical simulations, we’ve neglected to remember what is best for wargaming as a whole; for our hobby and the future generations of armchair generals who might come after us. Let’s establish the Historical Foundation. Think back ten, fifteen or twenty years ago when you began in this hobby (as the readership polls indicated that’s when you got started in wargaming). In those “good old” days of yesteryear, wargames were often new, exciting and different. Additionally, they were, if not always good, at least interesting games. They were made by designers for whom that wargamer was a labor of love to design and develop (of course, we complained back then, as we do now, that games never seemed to be developed enough). ‘Mere were a few real diamonds in the rough out there, and most were at bargain basement prices, packaged in envelopes or zip lock bags. One thing you could count on fifteen years ago was a diversity of subject matter in your wargames. In those days, with a 500 copy print run, companies could (and did) sell out of even the most esoteric games imaginable! Wargame collectors know about all of these wargames from the countless smaller and “one shot” companies. Games like Jerusalem 70 AD, Ancient Conquest, A Mighty Fortress, and most of the “Avalon Hill Classics” would never see the light of day if published in 1987. (In case you haven’t noticed, Avalon Hill has cut back tremendously on the availability of their less popular era and older titles, most of which have gone “out of print”). In those days, virtually every wargame designer was an “amateur” designer and virtually every wargame company was an “amateur” game company operated out of someone’s garage. We were much closer to the hobby then. Closer to being designers, closer to being writers, closer to the dream of starting up our own small wargame company in our copious spare time.